MPower, a leading Australian solar products distributor is proud to announce the release of a new solar inverter that will revolutionise the residential and commercial solar power sector in Australia. 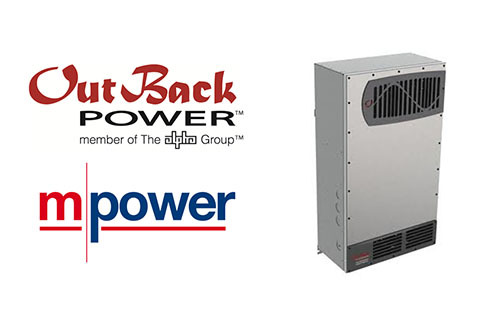 The Outback Power Radian Inverter is the latest in a highly successful product range from US inverter manufacturer Outback Power and has been approved under Australia Standards AS4777 and AS3100 for network connection. The Radian Inverter offers the capability to provide seamless transition from grid to battery power according to a wide range of variable parameters, such as load shifting to off peak periods and backup power in the event of grid failure. It is also anticipated to take the off-grid sector by storm, offering a scalable solution from 7 – 70 kW in single and 3 phase configurations. MPower has the unique advantage of combining products such the Outback Power Radian Inverter with their extensive selection of battery, generator and solar PV components to provide a unified solution for virtually any grid hybrid requirement. As Australian utilities move towards time of use metering, MPower sees Radian Inverters being at the heart of the second wave of solar PV installations. MPower’s National Sales Manager for Solar Products, Mr Ed Blackley said “Owners are now seeking to control their use of grid power to off-peak times, while maximising utilisation of their on-site solar PV electricity”. MPower is proud to offer a range of sustainable energy products and solutions and is proactive in importing, distributing and designing innovative, dependable products for the renewable energy industry. For media enquires contact MPower on +612 8788 4600 or email knowledge@mpower.com.au .